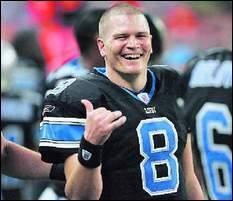 I didn’t believe Jon Kitna when he said that the Detroit Lions were a 10-win team this pre-season. But the way they’re playing, they should easily hit the mark. But after this weekend’s 44-7 drubbing of the Denver Broncos, an NFL axiom has been laid to rest. The Denver Broncos can no longer run roughshod over the competition. There is a reason for this. Tom Nalen, their all-world center, has been on injured reserve for over a month now. It is not often that an offensive lineman is the keystone of your offense, but Nalen has been one of the premiere centers in the NFL for a generation. Plus, the Broncos are 1-3 since losing him. That’s why I want the voters in Canton to fast track Nalen’s Hall of Fame application. With Nalen out of the lineup, the Broncos and their vaunted rush offense has averaged less than 75 yards a game. All of a sudden, the mystique of the zone running game is gone, and Mike Shanahan is left grasping at straws. If it wasn’t obvious that one man out of eleven was so important, ask Shanahan. “Tom, I believe, is the best center to ever play the game,” notes Shanahan. And while Nalen should return for next year, why put off making his bust for Canton. This season has been a remarkable example of how important offensive line play can be in the NFL. It also vividly demonstrates that no matter what people say about offensive and defensive schemes in the NFL, the players you’ve got in the system are more important. Schemes are important, but having the right personnel is vital.